The Desert Spring Autoflush is a companion product to the Desert Spring Furnace Humidifier. It is designed to remove minerals on a regular interval which is set by the homeowner or contracted installer. This interval can be set so that the unit flushes the humidifier basin anywhere from every hour to once a week. The duration of the flush can also be set anywhere from one minute to two hours. Most customers only require one minute so will usually use that setting. 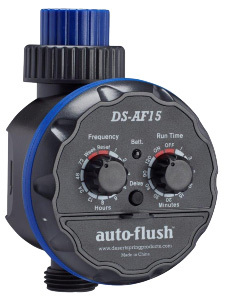 On each flush, the autoflush system opens a miniature ball valve, allowing the water in the basin to flow out and fresh new water to flow in, washing any residue away. Although this product will minimize the maintenance of your Desert Spring Furnace Humidifier, it is still recommended that you clean the unit once a year when the humidification season ends. The Desert Spring Autoflush eliminates mineral build-up by systematically flushing the unit at a user-set interval. This interval can be set by the homeowner so that it is optimal for the amount of mineral in their water supply. As this product significantly reduces the build-up of any mineral deposits in the basin of the humidifier, it significantly reduces the maintenance required for those individuals with very hard water. An annual cleaning of the unit at the end of the humidification season is still recommended if any mineral build-up still occurs. With it's unique flushing system, the Desert Spring Autoflush prevents water from sitting in the basin of your humidifier for more than 48 hours. Specialists agree that once standing water has passed the 48 hour mark, the risk of bacteria growing increases dramatically. The installation and use of the autoflush greatly decreases the chance of bacteria establishing any foothold in your humidifier, and thus in your hot air system and the air in your home. The three leading flow through furnace humidifiers in the North American market waste between 5,000 and 8,000 gallons of water annually, assuming a 17 week heating system with a call for heat 50% of the time. The Desert Spring furnace humidifier without the autoflush wastes no water at all, as all the water that enters the unit is put into your air. With the autoflush the desert spring uses minimal, with the actual amount depending on the setting.